Shown are five images of contrasting adjacent fields in Brookings County, SD. 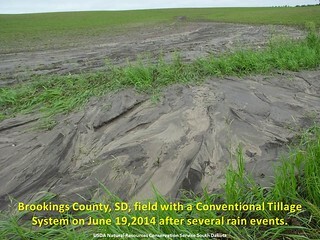 The soils in the area were saturated from a series of rain events. The difference between the fields is the management of cropping systems, i.e., a no-till cropping system and a conventional tillage system. Hours after a storm left .80 rain, the soil in the no-till system field was still able to infiltrate some water and, more importantly, slow it down before it left the field. By contrast, the adjacent field under conventional tillage had run-off that moved tons of topsoil off the field leaving it as sediment along the edge and in the road ditch. For information about soils, help transitioning to a conservation cropping systems or technical assistance for other conservation practices, please see your local USDA Natural Resources Conservation Service staff. Photos by USDA Natural Resources Conservation Service South Dakota.